Everybody wants to look spectacular on their big day, and usually that means skincare regimes, spray tans, detoxing and hair trials, but for some, this also involves finding ways to cover up their tattoos. Whilst tattoos can be beautiful and expression of the bride’s personality, some people just don’t want to have them on show on their big day. But don’t worry help is at hand. 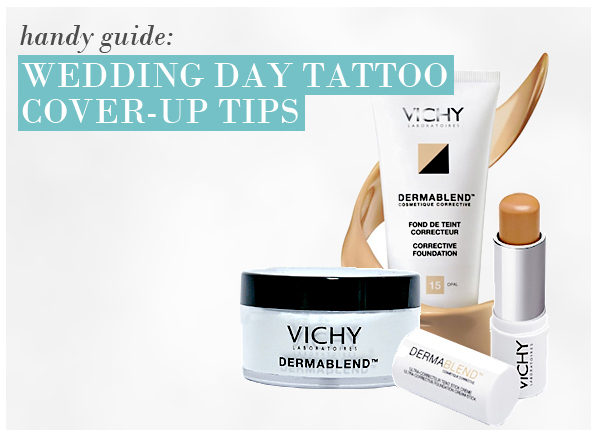 Vichy’s Dermablend range of camouflage make-up provides great cover, and when used with the setting powder will provide a water (and sweat) resistent hold for up to 16 hours (plenty for a wedding day). Dermablend is also great for covering birthmarks, scars, discolouration or any other blemishes you may be worried about. This was cheaper than else where. I always buy one tone lighter than my natural skin colour, it covers easy, just a little rub to blend, then I put face powder over the top and voile! brown mark gone.....I would recomend this, its more expensive than foundations but you only have to use a little and it last and its worth it. This entry was posted on Thursday, July 8th, 2010 at 9:15 am and is filed under Hints & Tips, Lifestyle, Make-up. You can follow any responses to this entry through the RSS 2.0 feed. You can skip to the end and leave a response. Pinging is currently not allowed. Thanks for writing this topic. I just want to let you know that I just check out your website and I find it very interesting and informative. I can’t wait to read lots of your piece of informations as this nice information, valuable and good design, as share valuable stuff with good ideas and concepts, lots of beneficial information and inspiration, both of which we all need, thanks for all the enthusiasm to offer such helpful information here.